Most of the blogger even drop their blogging career because of not knowing the proper way of earning money from their blog. Making money running a blog is not luck but your smartness in blogging and obvious dedication with an aim. In the course of blogging, I’ve seen so many bloggers earning much money, and at the same time lots of bloggers just read the articles written by pro-bloggers but do not follow them properly. So you need to know your own weakness, learn a lesson from them and boost our blog accordingly. There are few mistakes most of the bloggers make at the end of not earning good money online. I am writing this article because most of the time I got one common question in the Facebook mail. What is the cause I am not able to monetize my Nepali blog? I will explain the 5 reasons below. #1. Searching for Money Making Shortcuts: I’ve seen most of the new bloggers wants to earn more money and in a short period of time which is almost impossible unless you are extremely lucky. It takes a time to make money online and you really need to do some smart work. No any monetization platform like affiliate, books or advertisements makes you rich in one day. But one this is sure, if you have a lot of passion, you can be a good professional blogger in 4 to 5 months. For this, you really need to invest your time and many experiments. After then you can earn some good bucks online. #2. Lack of Practice: If you are dreaming of making lots of money just buying a new domain name and starting a blog, then you need to wake up soon. The reality is quite different in the sense that creating a blog and posting some articles won’t make your dream come true. At first, you need to know the ways to earn money online and even learn how to do it in a smart way. Only reading other’s articles and implementing new things with no any proper planning will not make a successful blogger. However, by reading articles from other bloggers/authors, you learn lots of things but you need to plan before applying for you. You can always ask your senior blogger for help. Their experience will teach to walk on the right path. #3. Fear of Obstacles: Nothing is free. You probably know this phrase. If you really wanna make money, then you should prepare yourself for any obstacles that may come later in your blogging career. There’s a Nepalese proverb “जिन्दगीमा सधैं दूध र भात पनि त नशिव हुँदैन” which literally translates “not all the days are same”. At first, you will feel that you are gonna end up only dealing with problems but not making money. Yes, there are problems. Back in 2009, I used to think there are lots of problems but now there are less of that type but still, problems are there but of a different kind. But trust me, calm down and search for the exact solution where you are stuck at. You can take help from other bloggers. It will make you feel better, your problems will be solved and you will learn many new things to deal in future too. #4. Curiosity: It is one of the most common mistakes many bloggers commit. This is popular among all bloggers that they search for any possibilities of making money online. They choose many money making options and end up testing various money making platform only with almost zero revenue generation (doesn’t apply to all). What I have learned is, this will lead you to zero success in earning money online. So, always be focused on one thing, aim the target and invest your most productive time. You will definitely be successful in this game. #5. Passion-less: Only your passion and hard work will take you towards your dream. If you have passion and hobby to make a blog then just add some more positive effort to make it go well forever. If you pose this quality, then you can easily overcome all the obstacles in your way and fulfill your dream. I hope this article will inspire you and encourage you to make your blog better and helps you monetized your site in a better way. If you have any queries, feel free to comment below. 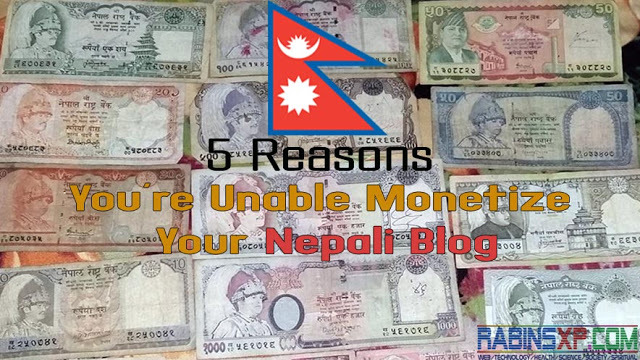 This article “Unable To Monetize Your Nepali Blog – 5 Reasons For Nepali Bloggers” can be read in Nepali Version at “आफ्नो ब्लगमा मुद्रीकरण (monetization) गर्न नसक्ने तपाईंका ५ कारणहरू”.